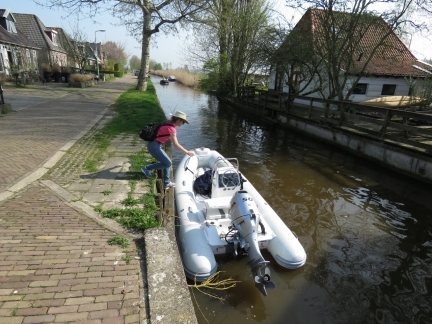 We set of from Harlingen just past 7am on a warm and sunny day to test the new tender on a longer trip and to enjoy the inland canals. 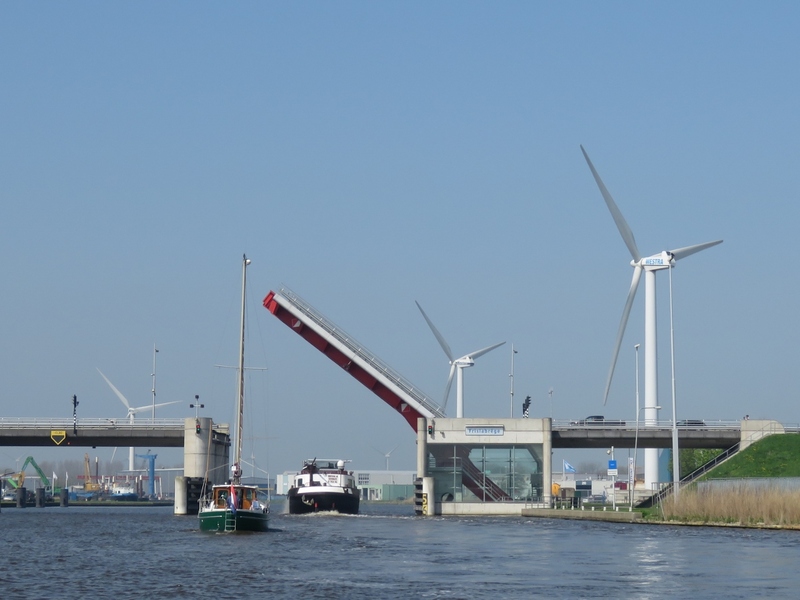 After passing through the sea lock, we spent several hours touring the narrow and shallow inland canals, passing through small towns and alongside old-style Dutch windmills. At Franeker we had a great lunch along the water before touring the canals that run through the historic city. 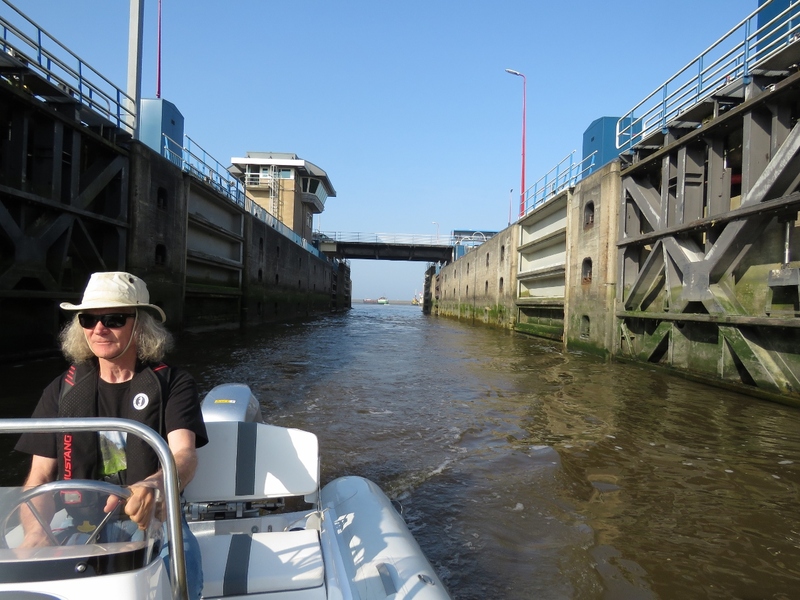 Passing through the Harlingen Sea Lock. Locking through is free, with boats of all sizes constantly passing through. 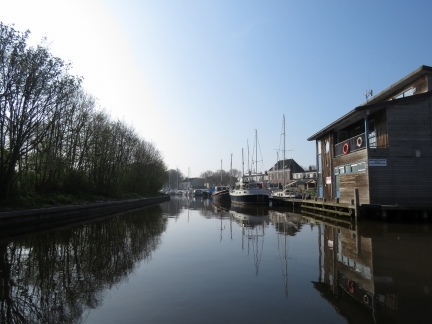 The inland canal passing behind Harlingen, just around the corner from the sea lock off the main canal. Dirona could pass through the sea lock and run along the main canal to Leeurwarden at least, but these smaller canals are suitable only for vessels with shallow water draft and low air draft. 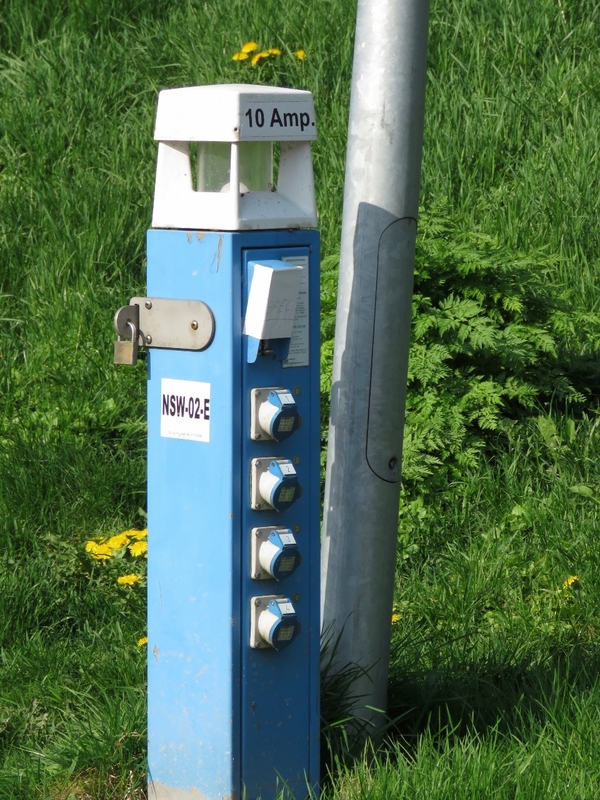 The power pedastals along the canal supply only 10 amps. 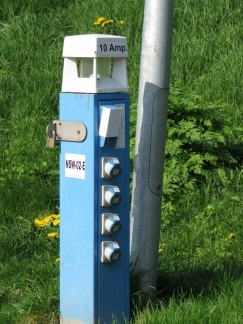 Running on 10 amps would be a challenge for Dirona, but after we install our twin shore power design we could easily run on 2 10-amp, or even 2 8-amp, shore supplies. 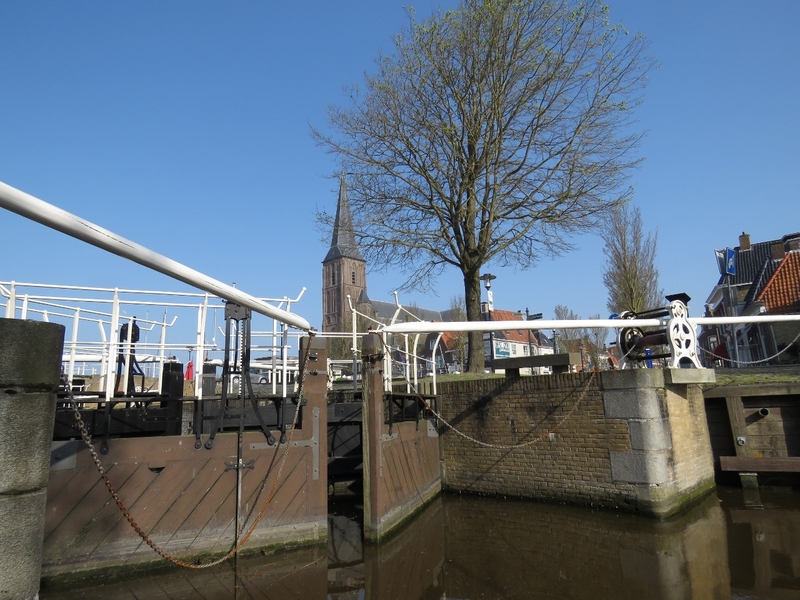 The sea lock into Zuiderhaven where Dirona is moored in front of the church visible at the center of the picture. The lock is operational by appointment. 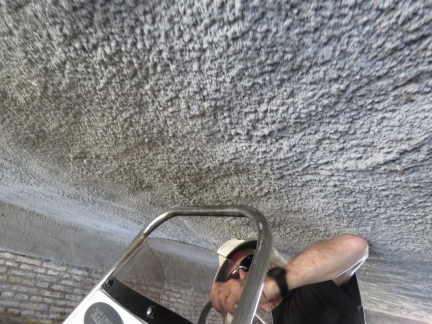 Passing, just barely, under the lowest bridge on our trip. Kees Verruijt recommended the circular route we are taking and suggested we run counter-clockwise to ensure we could get under this bridge from the start. Otherwise we’d have to return all the way back if we couldn’t make it. 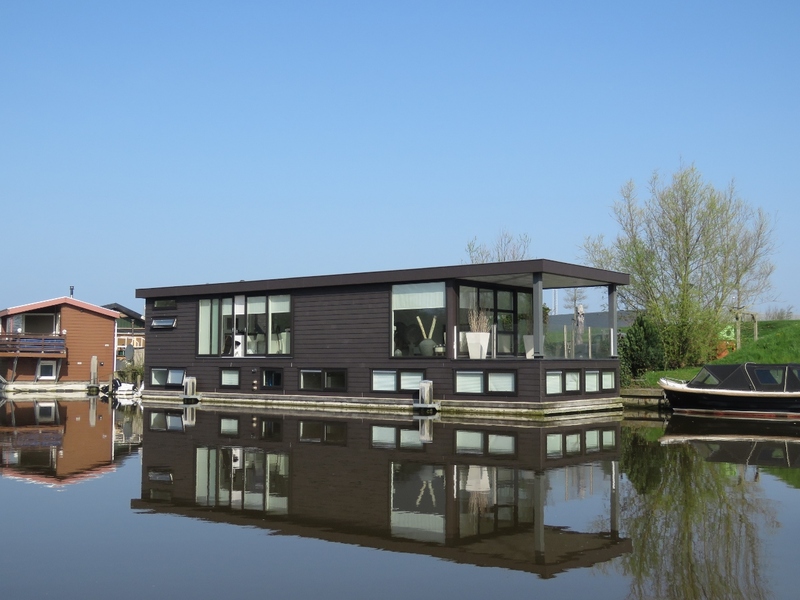 A spectacular float home in Zuidergracht, just south of Zuiderhaven where we are moored. 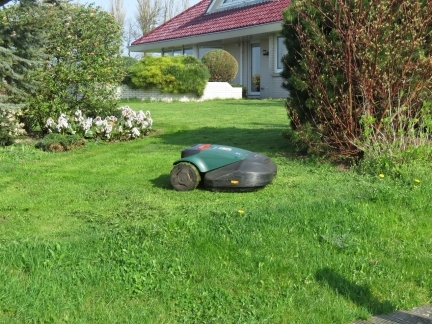 An automated lawn mower was working on the one of the yards alongside the Harlingervaart canal. 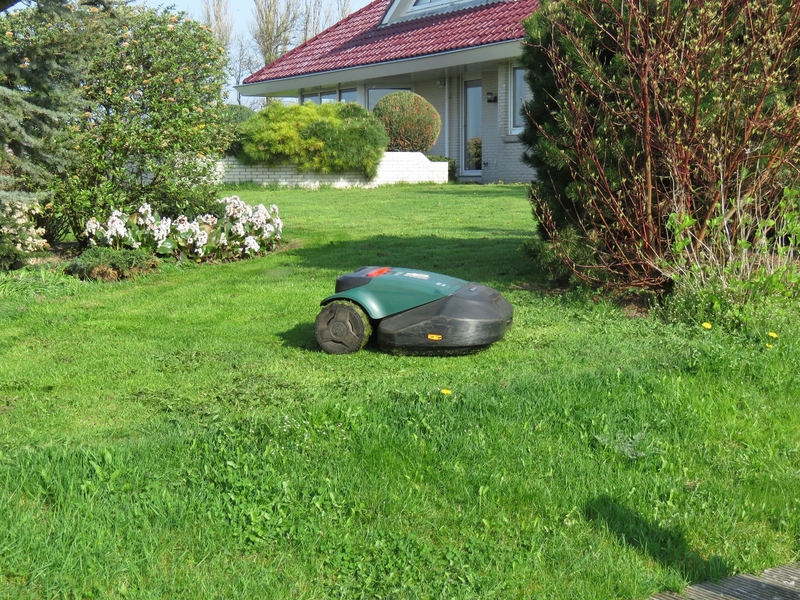 We’ve passed out of the more built-up area around Harlingen and into an agricultural area. The land here is very flat, and all below sea level. Passing through the village of Kimswert, the first on our route. We’re having a wonderful time on our canal tour. 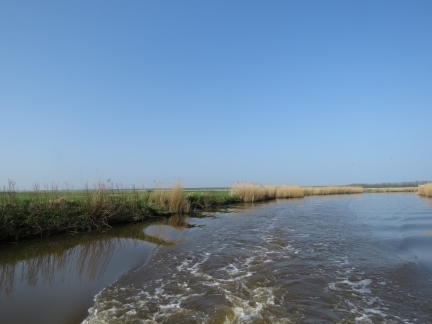 The day is clear, warm and sunny and the scenery is fabulous. 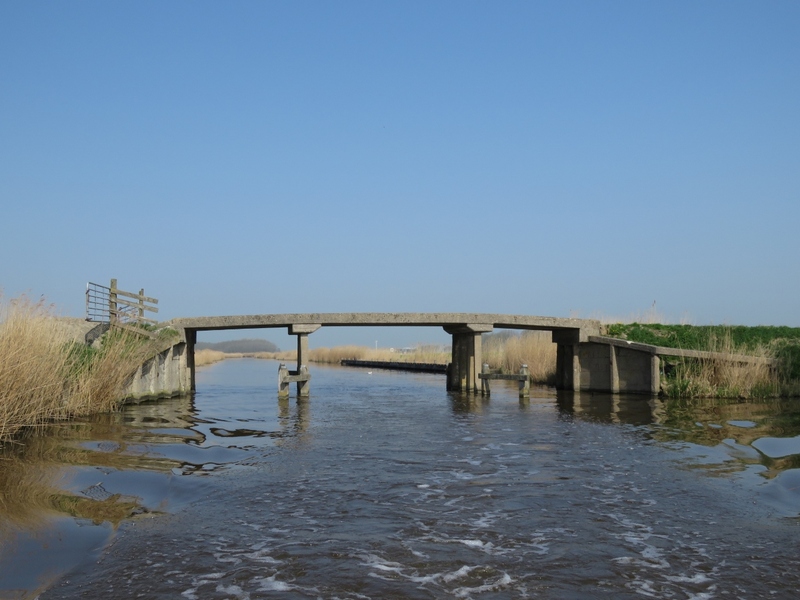 It took a second to figure out why this road bridge looked so unusual—it has no side rails. 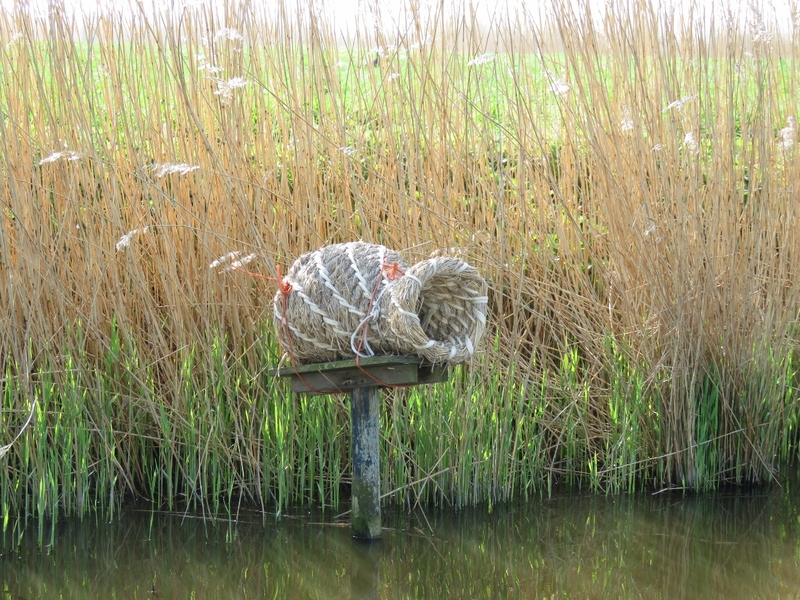 One of several beautiful nesting baskets placed for the local ducks. The baskets give ducks a place to nest that is safe from land-based predators. Even other birds, such as crows, are less likely to enter an over-water nest. Historically, people used the baskets to encourage ducks to nest inside in order to collect their eggs. We tied off at the town of Arum for a walk around. The new tender is running well and looks great. 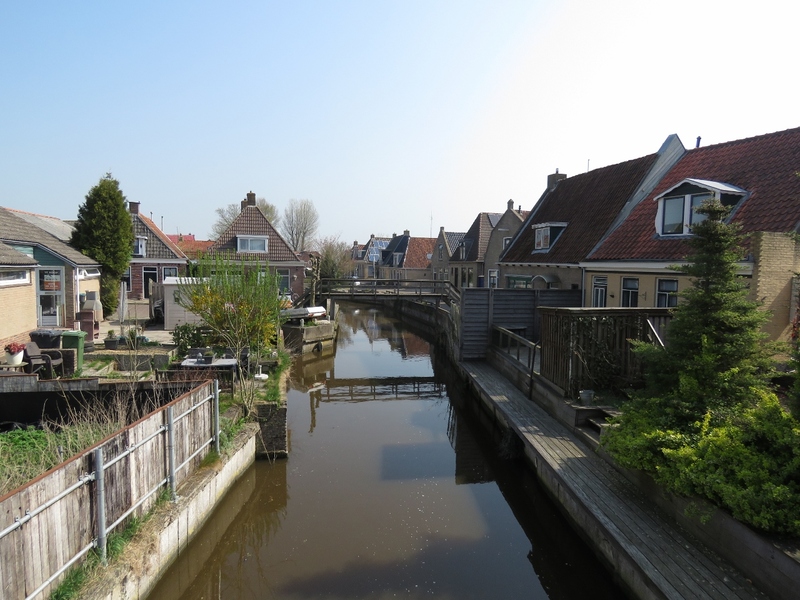 Overlooking the canal we just passed through, Arumer Feart, on a bridge in Arum. We had an enjoyable walk through town—as with all things Dutch, everything was neat and tidy. 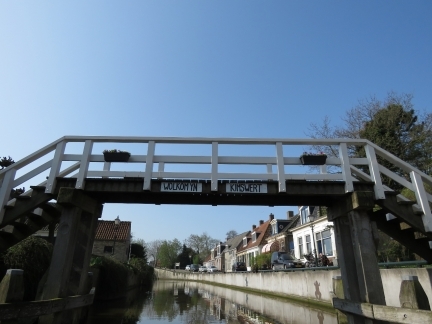 We’ve passed many canal intersections, but none were signed. 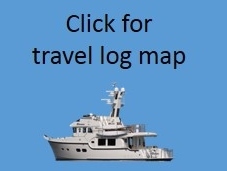 If we didn’t have charts on our phone, we’d have had a difficult time knowing where to turn. 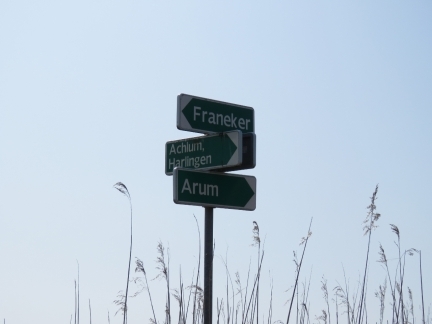 This is the first intersection we passed with a direction sign. A traditional Dutch windmill just north of Arum. 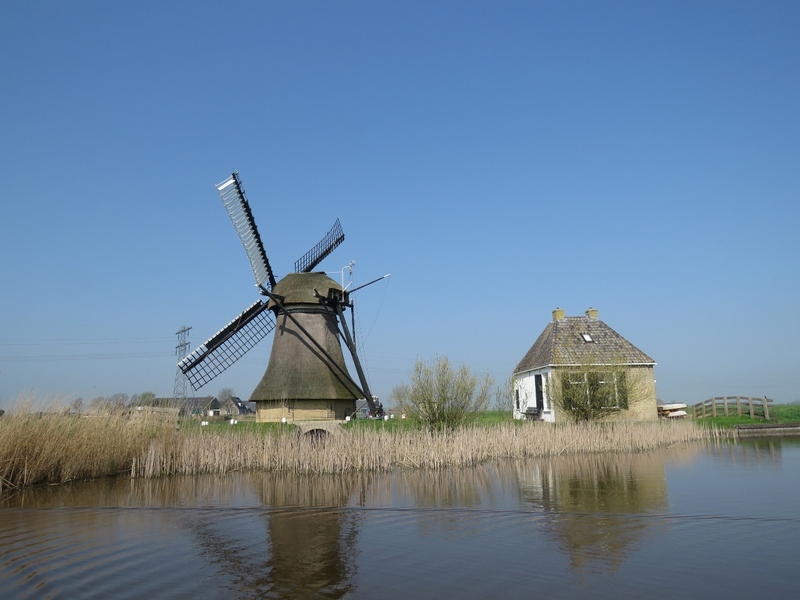 These windmills were built to create new land through pumping the water out of lakes and swamps, and to prevent flooding. 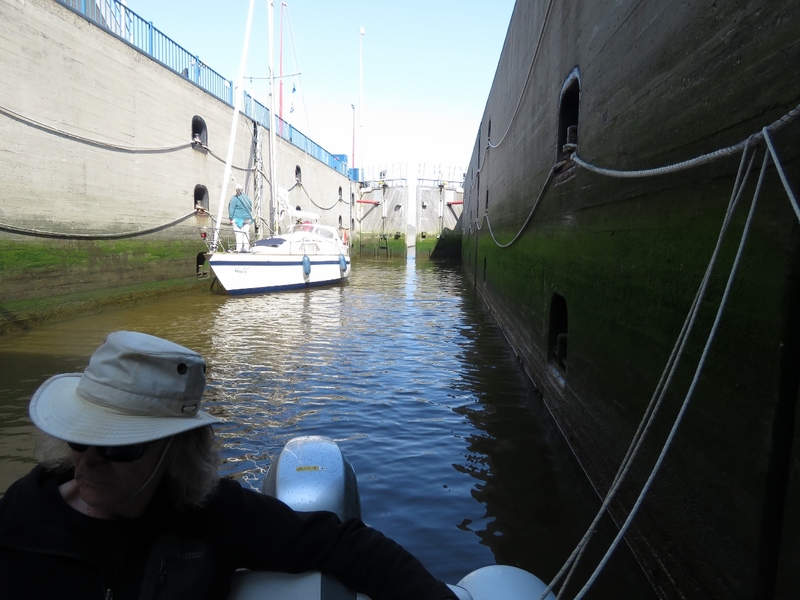 We’ve looped back to the main canal about five miles east of the Harlingen sea lock we passed through earlier today. 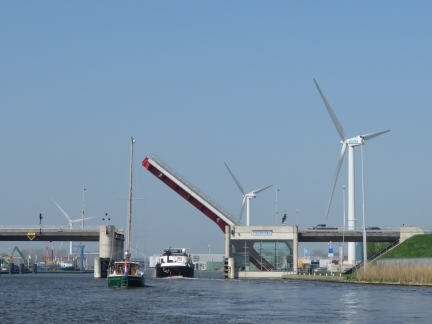 The Fristabrege on highway N384 has lifted to allow a barge and a sailboat to pass through. Checking out a small marina off the main channel. 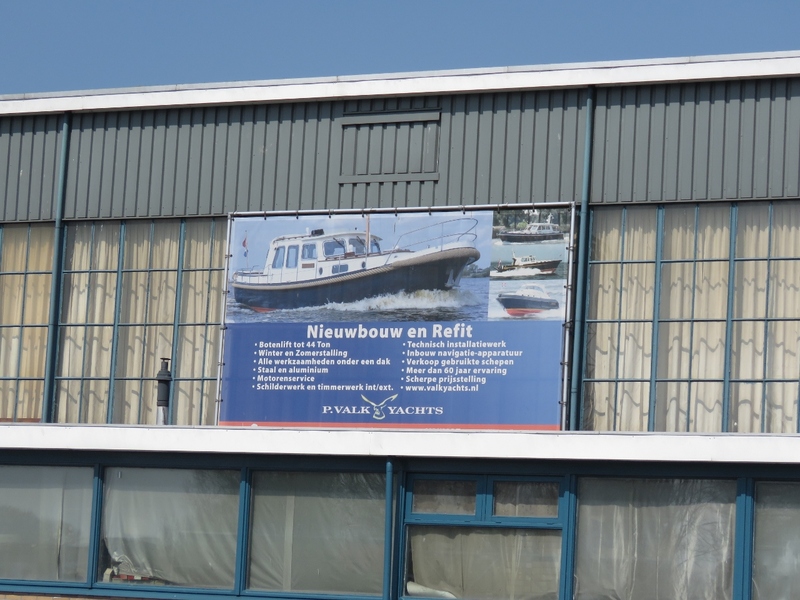 We passed several boat builders along the main canal. 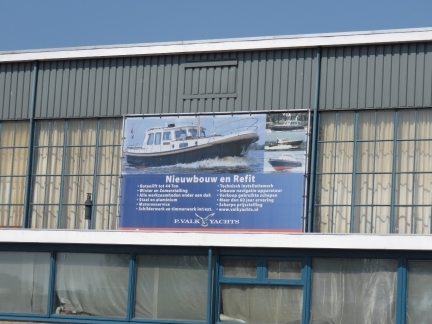 P. Valk Yachts builds some beautiful-looking steel boats. 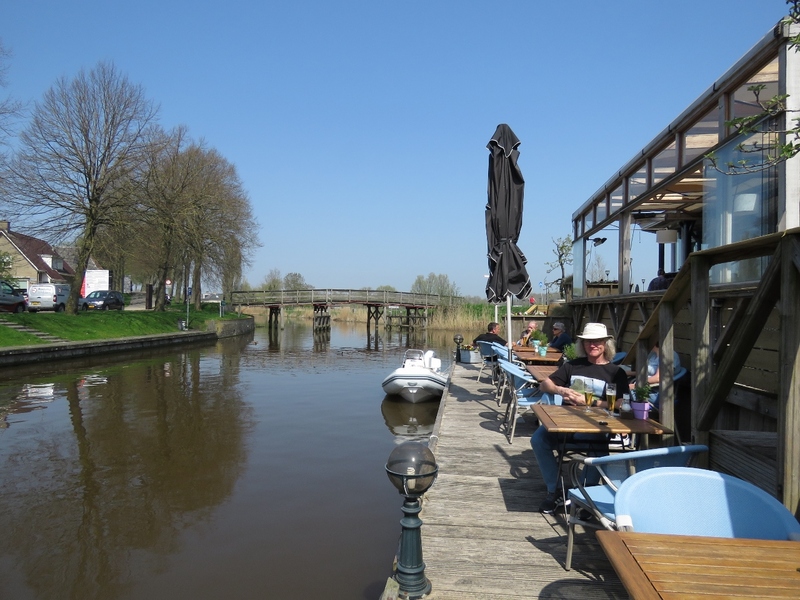 The patio at the De Stadsherberg hotel in Franeker caught our attention as we passed. We returned back to have lunch at a wonderful table overlooking the canal with our new tender moored just behind us. 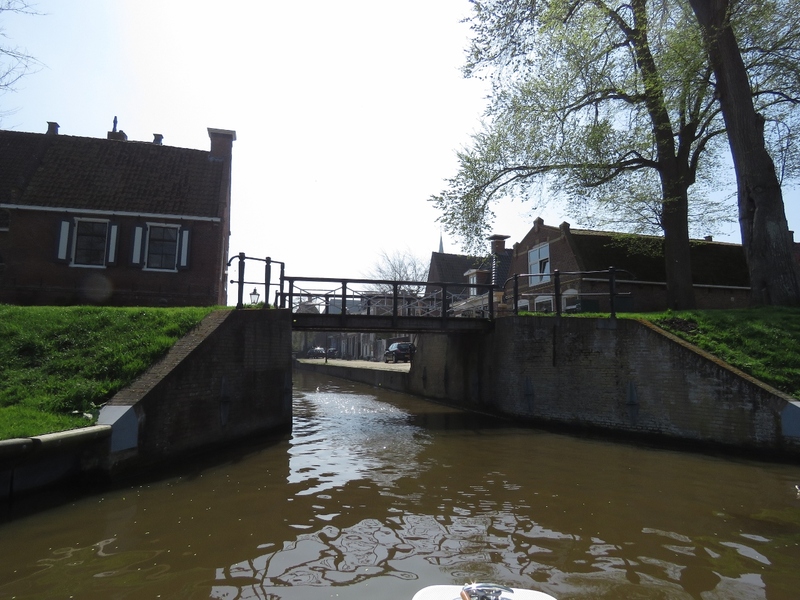 After lunch we tried to follow the interior canal through Franeker. 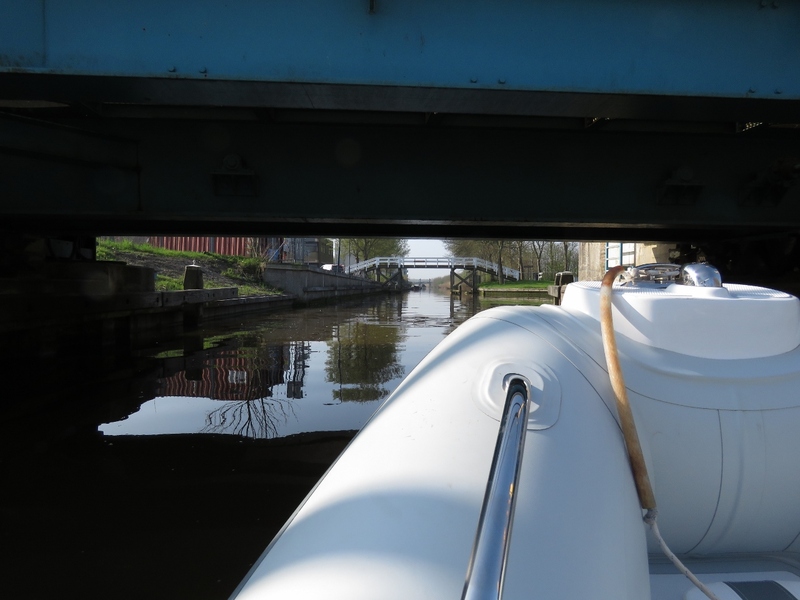 We easily passed under this brige, but couldn’t get under another a short distance inside. Proceeding around the canal ringing Franeker, we found another entry into the interior canals and were able to run right through the city center. 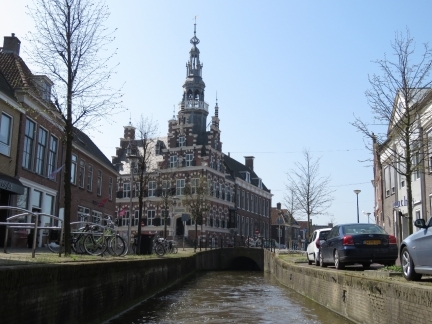 The ornate Franeker City Hall building dates from the late 1500s. 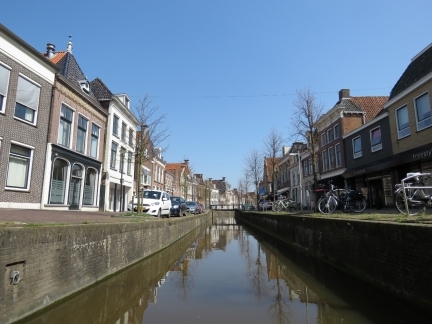 Nearby is the highly-recommended Franeker Planetarium, the oldest working planetarium in the world. We had planned to visit it a subsequent trip to Franeker, but didn’t end up returning. Perhaps we will stop in on our way to our from Amsterdam this winter. 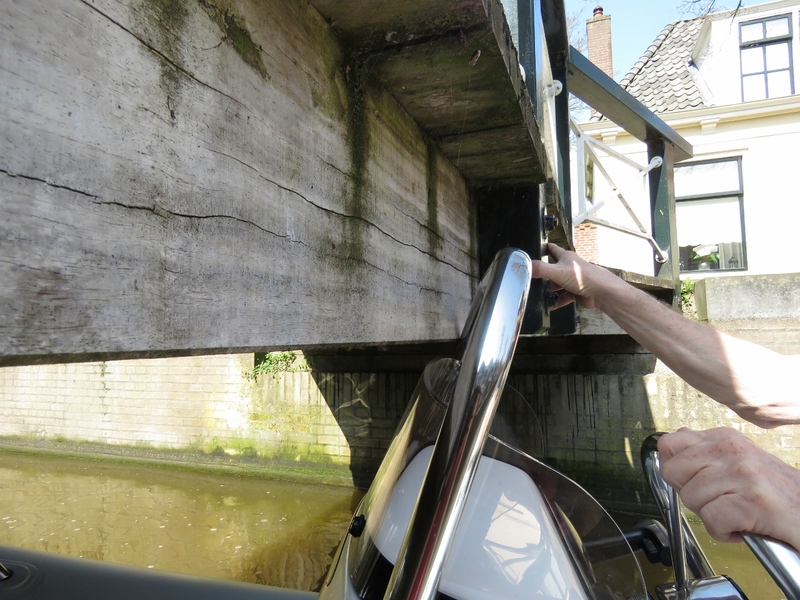 We barely made it under this bridge in the Franeker interior canal. We were close to getting all the way through Franeker and back out to the canal ringing the city, but we weren’t going to fit under this bridge. 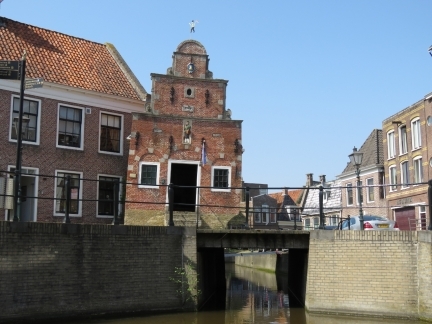 The Korendragershuisje in Franeker, now with a distinct lean, was built in 1634 for the Corn and Grain Carriers Guild who were responsible for distributing corn and grain from incoming ships. The blue crest at the top is the old city’s coat of arms and below is a grain carrier holding a grain meter. 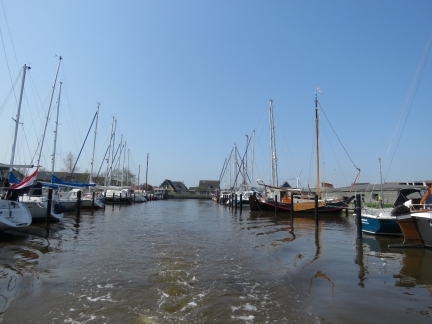 We were all alone in the Harlingen sea lock this morning, but returned back out with the sailboat Habibi. 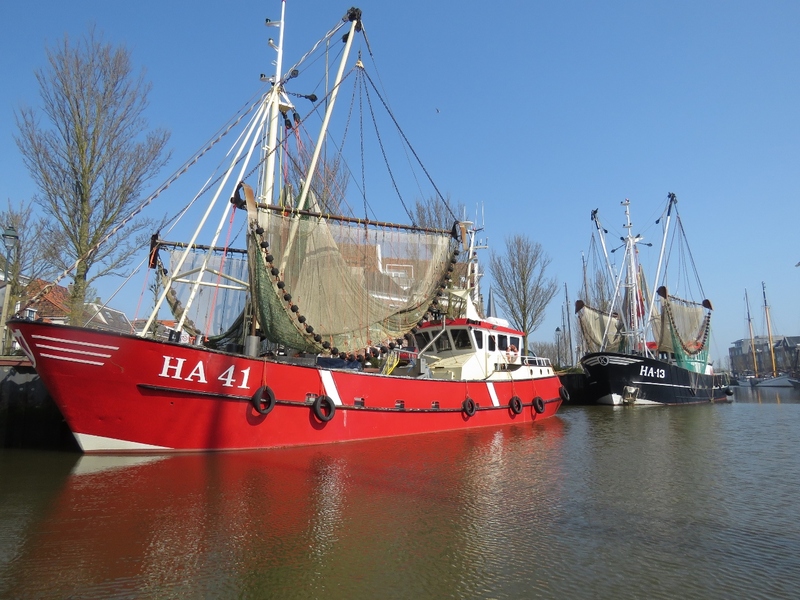 The fishing vessels HA 41 and HA-13 in Zuiderhaven with their nets strung above deck.